These Coconut Chocolate Bites have just two ingredients and make a great snack. They are also on the healthier side of the naughty scale! I’ll admit I totally pinched this idea :) My darling Mum bought me a bag of coconut chocolate chips recently and they were stupendous. Admittedly they didn’t last long and when I went to replace them I realised how pricey they were. Out of the cupboard flew a bag of toasted coconut flakes and a bar of dark chocolate. I didn’t have the patience or ability to separate each and very little piece of coconut like the bought variety, instead piling them up into tasty little heaps with 2 teaspoons. 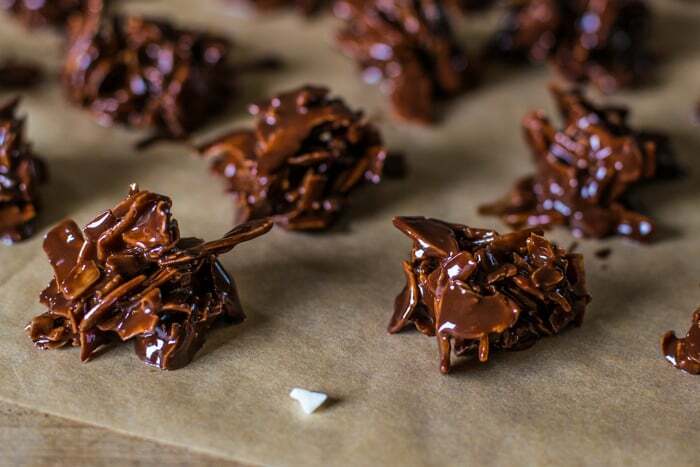 The absolute hardest part of this entire recipe is waiting for the chocolate to harden, as however good you think they taste warm, just wait till you pop one straight from the fridge! YUM!!! They are very moreish so I recommend hiding the tub at the back of the fridge or, and I may try this with my next batch, freezing them individually so that you just take 1 or 2 rather than 8 or 9 :) However this may well make the coconut pieces soften so if anyone tries it before I do please let us know how you get on. 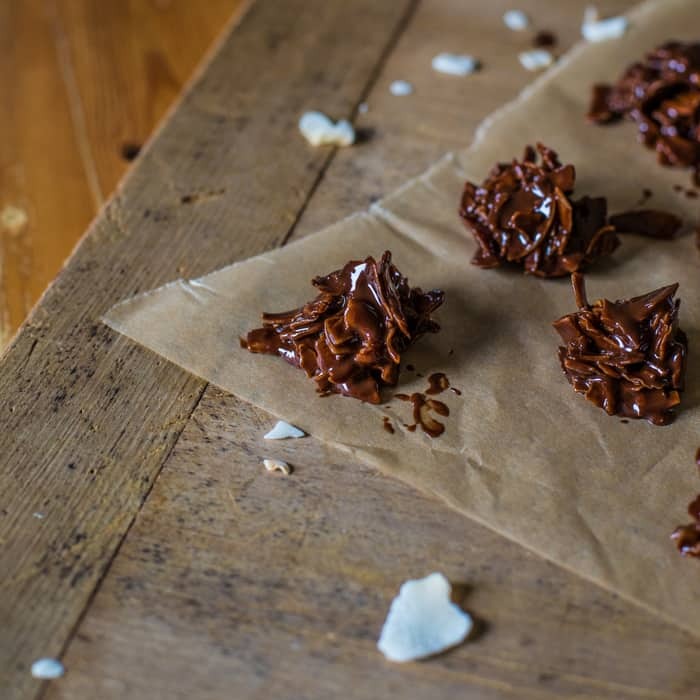 You could of course use any coconut flakes when making these coconut chocolate bites, but I have a real soft spot for the toasted variety. They are slightly nuttier in taste and pair remarkably well with dark chocolate. These coconut chocolate bites would of course make a great gift too. Pile them up in a little repurposed chocolate box, or wrap in a cellophane bouquet. And if you don;t have the time (or inclination!) to make these for others, but you want to give a fun gift to your favourite chocoholic, give this chocolate bouquet tutorial a bash! Break the bar of chocolate into a pieces and melt in a dish over a small pan of simmering water. 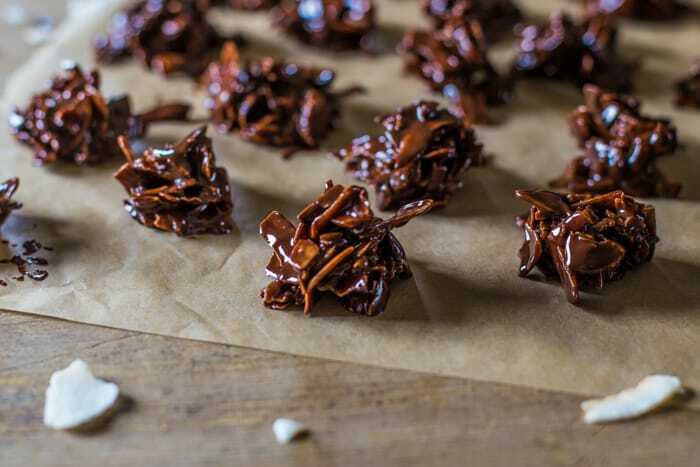 Stir in as many coconut flakes as needed - you want each flake to be well coated as this will prevent them from softening in storage. Using two teaspoons pile up little mouthful sized hummocks onto a baking tray lined with a piece of greaseproof paper on. Pop in the fridge to harden and indulge at your leisure. Wow they look so good and I think my kids would love making them with me (and eating them!). I would definitely need to hide them in the fridge! My four-year-old daughter just looked over my shoulder at these and is now begging me to make some! I’ll report back!